When a charter school closes, the charter school notifies the Board of who will be maintaining the school’s student records and provides the Board with contact information. In some cases, the closed charter school’s student records are maintained by the Board or by the Arizona State Library, Archives and Public Records – Archives and History Division (“State Archives”). More information may be found below. To request records from one of the closed charter schools listed below, provide the information listed below in writing via email. To send your request by post mail, see the "Contact Us" box at the bottom of this page. Missing information or misspellings may lead to a delay in locating records. Each request will be processed timely and within the order that they are received. To request records from one of the closed charter schools listed below, contact the Arizona State Library, Archives and Public Records – Archives and History Division ("State Archives"). 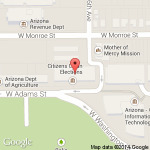 The State Archives is located at 1901 West Madison in Phoenix and its fax number is (602) 256-7982. Before you visit, call (602) 926-3720 to arrange for materials to be pulled in advance. The State Archives' business hours are Monday through Thursday from 9:00 a.m. to 3:00 p.m. If your closed charter school is not listed above, access ASBCS Online's closed school search and enter all or a part of the school’s name in the “Charter School Name” field and select “Search”. The search results will include who maintains those records and how to reach them. If you have any further questions, contact our office at (602) 364-3080.